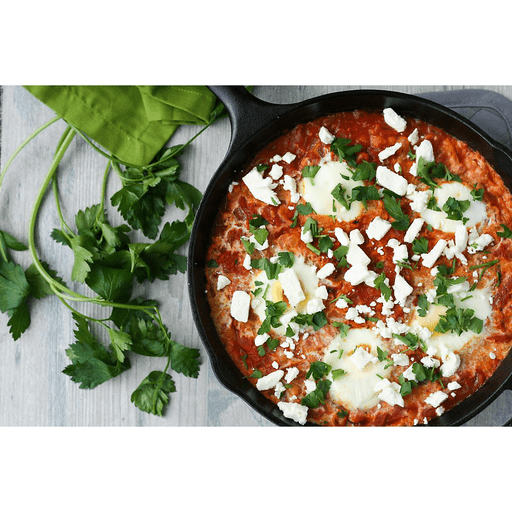 Originating in North Africa, Shakshuka (or Eggs & White Beans in Tomato Sauce) is now enjoyed by many cultures throughout Africa and the Middle East. Although traditionally enjoyed for breakfast, this 20 minute meal is also great for a quick and easy supper! 1. Heat olive oil in a large skillet over medium heat. Add garlic and onions and cook until onions are translucent, about 5 minutes. 1. Add canned tomatoes with juice. Stir in paprika, cumin, oregano, salt, pepper and red pepper flakes. Simmer for 5-7 minutes or until sauce thickens slightly. 1. Add cannellini beans to skillet and simmer for 2-3 minutes or until beans are hot. 1. Crack five eggs into the skillet. Cover and cook for 5 minutes or until eggs are cooked to preference. Top skillet with parsley and feta. Serve warm. For dairy free: Omit crumbled feta cheese. Calories 270, Total Fat 13g (Saturated 3.5g, Trans 0g), Cholesterol 195mg, Sodium 580mg, Total Carbohydrate28 g (Dietary Fiber 7g, Total Sugars 10g, Includes 0g Added Sugars), Protein 15g, Vitamin D 6%, Calcium 15%, Iron 30%, Potassium 15% *Nutritional values are an approximation. Actual nutritional values may vary due to preparation techniques, variations related to suppliers, regional and seasonal differences, or rounding.